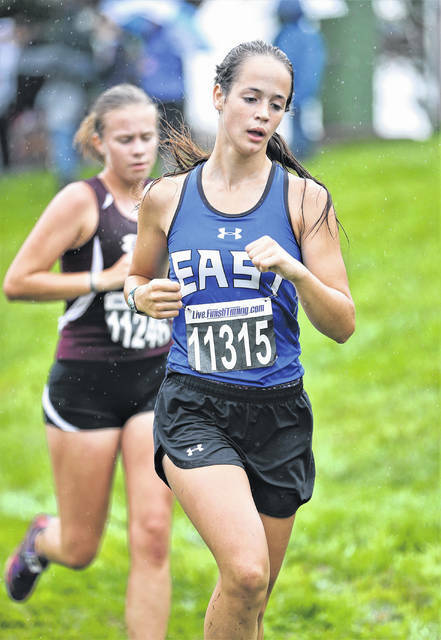 Lee Woolery Photo Miami East’s Marisa Savini runs at the Troy Invitational Saturday. TROY — Russia, Miami East and Newton girls cross country teams competed at the Troy Invitational Saturday. Raider runners included Becca Seger, 10, 20:57.8; Ella Hoehne, 38, 22:35.8; Anna Fiessinger, 47, 23:01.4; Emma DeLaet, 70, 23:50.6; Clare Caldwell, 82, 24:09.0; and Natalie Klosterman, 142, 26:32.9. Miami East girls finished 11th. Viking runners included Kiley Davie, 23, 21:57.5; Marisa Savini, 35, 22:29.6; Paige Blauvelt, 109, 25:09.7; Elizabeth Bennett, 157, 27:29.4; and Cyrena McAdams, 200, 30:09.9. Indian runners included Kendra Kern, 54, 23:22.5; Baily Chaney, 73, 23:55.1; Faith Williams, 111, 25:12.8; Kara Chaney, 146, 26:52.9; and Makenzie Knupp, 171, 23:59.3. SPENCERVILLE — The Bradford girls cross country team won the Spencerville Invitational Red race Saturday, putting three runners in the top eight. Bradford had 52 points, while Delphos St. John’s was second with 85. Houston finished fourth and Covington was fifth. Bradford’s runners included Skipp Miller, 4, 21:19.0; Karmen Knepp, 6, 21:40.9; Austy Miller, 8, 22:00.5; Olivia Daugherty, 21, 23:35.8; and Mercedes Smith, 23, 23:53.2. Houston’s top seven were Hollie Voisard, 3, 21:14.9; Ava Knouff, 7, 21:41.2; Danielle Stephenson, 31, 24:26.8; Katrina Meiring, 35, 24:44.5; Amber Stangel, 42, 25:56.3; Libby Knapke, 46, 26:14.3; and Addie White, 47, 26:15.5. Covington’s top seven included Paige Boehringer, 2, 20:57.1; Ashlyn Plessinger, 13, 22:37.7; Chelsea Ford, 25, 24:01.7; Alexis Meyer, 39, 25:11.7; Haili Jo-Taxis, 59, 27:09.5; Allie Garman, 72, 28:45.0; and Kayla Mitchell, 86, 31:52.9. Lehman Catholic runners included Maria Schmiesing, 17, 23:15.5; Agnes Schmiesing, 28, 24:11.8; and Maggie Bezy, 58, 27:08.0. TIFFIN — The Versailles girls cross country team ran at the 50th annual Tiffin Carnival, finishing ninth in the Division III varsity race. The Tigers top seven included Madelyn Holzapfel, 48, 21:17.6; Emma Peters, 80, 21:57.7; Maria Mangen, 91, 22:13.8; Lauren Menke, 94, 22:17.0; Renea Schmitmeyer, 128, 22:53.2; Kara Spitzer, 131, 22:55.4; and Hannah Bey, 147, 23:08.9.
https://www.dailycall.com/wp-content/uploads/sites/30/2018/09/web1_090818lw_me_marisasavini.jpgLee Woolery Photo Miami East’s Marisa Savini runs at the Troy Invitational Saturday.